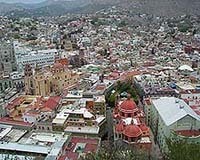 The city of Guanajuato (gwah-nah-HWAH-toh), which means "hill of frogs" in the indigenous language, was founded in 1552. It is located in Central Mexico in a narrow valley protected by arid mountains. Considered one of Mexico's colonial gems, Guanajuato became famous for silver when one of the world's richest veins was found in 1558 at La Valenciana mine just above the city center. It's houses and streets molded themselves to the local terrain of valleys and hills. The city grew by chance: a few homes here and there, plazas and narrow streets later joined at the foot of the markets and churches. The adaptation to local geography gives Guanajuato much of it's charm with narrow alleyways cobbled with stone and hidden plazas ripe for exploration. Around each corner is a new surprise, like the Callejon del Beso or Alley of the Kiss, whose name comes from a local romantic legend of forbidden lovers. Guanajuato is a city of history, a place where silver mining, the War of Independence, the American Intervention and the Reform Movement all shook the foundations of the city. Many of the cities buildings and churches are mentioned in history books on Mexico and UNESCO named the city a World Heritage Zone in 1988. 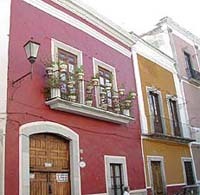 One of the more famous is the Alhondiga de Granaditas which is now a museum. 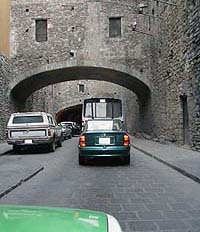 At one time it was involved in the seizure of the town during Mexican Independence. Not so historically important, but very popular is the Museo de las Momias or Mummy Museum. Located in the hills above town, this cemetery now houses a collection of over one hundred mummies who have been moved from their original grave sites and placed in this building. At an elevation over 6,700 ft., the dry mountain air is thought responsible for this phenomena. Historical architecture is found everywhere. Three 18th century churches of Churrigueresque style are found in Guanajuato: the Church of the Compañia, San Diego and San Cayetano. 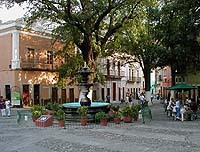 Other notable colonial buildings include the Juarez Theater, the University of Guanajuato, and the Diego Rivera Museum. You can also visit the Presa de Olla dam and the Pípila, which is a lookout above the city. Jardin de la Union is one of the many small plazas to visit. 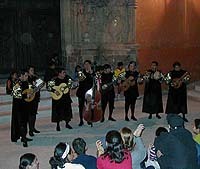 Cultural events are an important feature of Guanajuato. 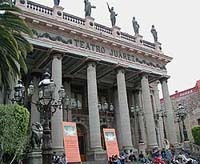 The most famous event is the Festival Cervantino Internacional, which takes place in mid-October. Skits and plays of Miguel de Cervantes (Don Quixote) are performed by students, as well as Mexican and international actors in theaters, parks, and plazas throughout town. The festival lasts from two to three weeks. At other times of the year, you will find that Guanajuato is a theater, art and music destination with it's many performances. One of the more famous are the strolling musicians called callejoneadas or estudiantinas who, in traditional costumes, usually begin on weekend nights around 8:30pm at the San Diego church. 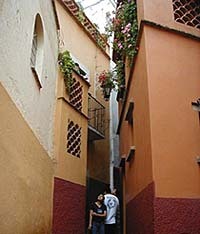 They lead a moving procession of singers and followers through the narrow alleys (callejons) of Guanajuato singing, telling stories and jokes in Spanish. Even if you don't speak Spanish, it's a great time. Guanajuato is now famous as the state of President Vicente Fox's birth, but it is also a growing language school destination for foreigners. You will also find local tours to the mines, modern businesses, local and nearby arts and crafts shopping and comfortable hotels ranging from ex-haciendas to bed & breakfast inns, to centrally-located colonial hotels.